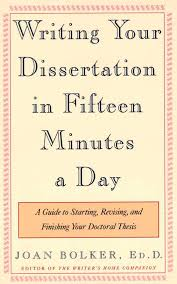 One of the few things I regret getting rid of during my “post-academic purge” was Joan Bolker’s Writing Your Dissertation in Fifteen Minutes a Day. She discussed a concept that is notably absent from most business and career books: fear of success. When we do talk about psychological barriers, we tend to talk about fear of failure – which certainly is a legitimate problem for many. There are other legitimate barriers – lack of skills/knowledge, limited professional networks, lack of opportunities, etc. But Bolker recognizes something important: if you’ve gotten into graduate school (or, I’d argue, gone freelance), you’re clearly smart, motivated, and quick to seize opportunities. There’s something else here, and I believe that thing is fear of success. You’re afraid of alienating friends and family. Social bonds are created based on shared professional ambitions (or lack thereof). When you start pursuing or change a major goal – it’s (potentially) going to negatively affect your relationships. Unfortunately, I’ve experienced this firsthand – both when I started in grad school and when I left academia after graduating. You’re afraid of the increased scrutiny, criticisms, and attacks. Ironically, as much as we fear being criticized for failing at something, we’re much more vulnerable by succeeding at something. There are always going to be people who are threatened by others’ successes – particularly among those who’ve never taken the professional risks needed to succeed. This is also something I’ve experienced firsthand (and, if I’m being painfully honest, engaged in myself). You’re afraid of getting tied down to something you don’t want. As I’ve mentioned before, one of the main reasons I left academia and started out in a career as a freelance performer/instructor was that I decided I’d rather fail at something I loved than successful at something I hated (or at least found boring and unsatisfying). When you’re successful at something, it’s hard to give up that status and say “no” to the people who have gone out of their way to give you opportunities. One of the best pieces of advice I’ve ever gotten is from an older colleague, who said, “An opportunity is not an obligation.” Since then, I’ve been less apologetic about chasing my own version of success and making sure to leave time/energy for other things that I love. While I’ve clearly examined this issue before, it’s become increasingly clear that I’m still dealing with my own fears of success. While it’ll take some work to overcome it, the first step is recognizing the problem. Do you struggle with fear of success? Can you think of other reasons for this fear?